Classes at Pierce College are less expensive than most university courses, which is why a lot of students choose to attend a community college prior to a higher-level institution. 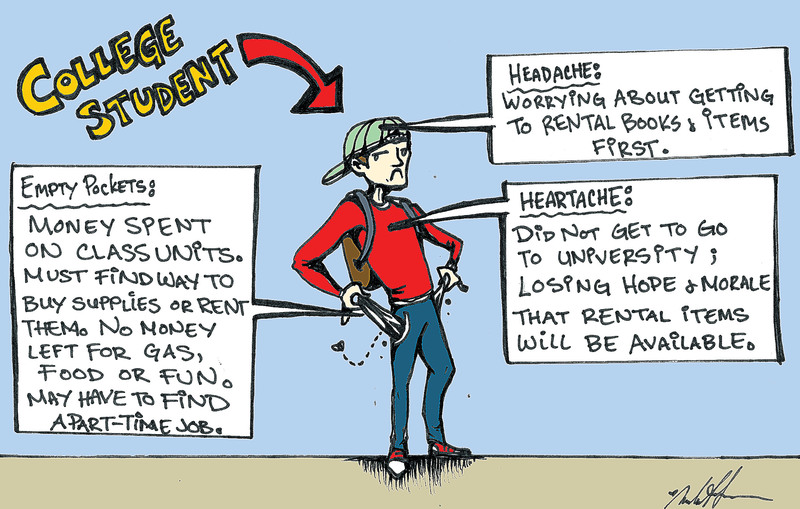 At $46 a unit, a student can be a full-time for less than $600 a semester. If someone actually wants to pass these classes though, they will have to spend a significant amount of extra money to purchase classroom essentials. It’s becoming increasingly difficult to take and pass a class with the prices it costs to actually attend. Most professors require a textbook. The textbook can range anywhere from $20 to $300 per class. Some professors allow an older edition of the textbook while others limit student’s choices to a more expensive, hard-to-find online version. In addition to that $300 textbook, the class can require a $50 in-class work booklet and a $90 online tutoring lab and homework aid. That $140 class is now toppling over $500. How are students who have dedicated their time to education expected to be able to afford the additional costs? While the Pierce bookstore offers a “rent-a-book” program, students are required to bring in a copy of their classes, a credit card, and student identification in hopes of receiving 40 percent off a book that they will only keep for sixteen or less weeks. This rental book must come back undamaged from sixteen long weeks of collegiate studying for a student to not be additionally charged. If a student can afford to buy a brand new book, the book buyback program is a complete joke, returning next to nothing in cash for a book that costs a small fortune. How are students supposed to learn, let alone thrive, when the mere cost of preparing for an A is astronomical? Pierce also offers a semester-long $25-$30 calculator rental through a program in the math department, that helps students who can’tafford a special $150 calculator for certain math classes. While the rental program is a great idea, the supplies are limited, leaving students out that don’t run from their first class to rent a calculator. Calculator supplies are depleted in mere minutes and many students are left carrying another financial burden on their grade. Fortunately for students, online options provide cheaper school supplies. Used books and class materials can be found at discounted prices, but must be ordered quickly as they go fast. Also, remember to order well before the start of classes to compensate for shipping as these materials are often needed on the first day. Many classes can be completed without textbooks or unnecessary supplies and professors could easily supply students with photocopied pages of related material for the discussions or the school could provide the library with more copies of textbooks. In a day where technology is king, we could use more books online and have less of a paper trail in classes.